1. Lay the pork in a dish or shallow bowl. Add 2 tbsp olive oil, the finely grated zest and juice from ½ lemon, fennel seeds, chilli flakes, 2 cloves crushed garlic, bay leaves and thyme leaves. Season and mix, cover and marinate in the fridge for 1 hour. 2. Trim the fennel, cut into 5mm thick slices and toss in the remaining 1 tbsp of olive oil. Season and set aside. Meanwhile, spoon the extra virgin olive oil into a small pan and add the remaining crushed garlic. Warm over a low heat to soften the garlic, add the parsley, capers and juice from ½ lemon, season and remove from the heat. 3. Preheat the barbecue (griddle or grill). Cook the pork chops (discard the marinade) on the barbecue until there’s no pink meat and the juices run clear (about 4 minutes). Remove from the heat and cover loosely with foil. 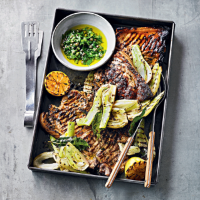 Cook the fennel slices on the barbecue for 2 minutes or until nicely charred on both sides and softened. Cut the remaining lemon in half and char the cut sides on the barbecue. 4. Lay the fennel slices on a serving dish, top with the pork chops and serve with the charred lemon pieces and herb and caper oil alongside.